It is always difficult to share an experience, it comes across as a description and seldom carries the fun or joy that is the reality. Rest assured, Witch’s Rock Surf Camp in Tamarindo, Costa Rica is to be experienced. If you are looking for pampering this isn’t it and it shouldn’t be. You will be associating with travelers not tourists, staff that is understanding, accommodating and helpful but not because they are “trained” to be…(“My pleasure”….you know who I am talking about) but just because they simply are and all this in an incredible environment that is warm, inviting and a great place to be, Pizza Hut notwithstanding. Be aware, you are going to surf or learn to surf and in doing so, you are placing your time in the hands of nature. What you want doesn’t necessarily count…what you are given does. If the waves aren’t great, they aren’t great. If the tides don’t accommodate your schedule…they don’t. If the winds blow the wrong way, they do and THAT is what makes this experience different. You get to forget all the crap that you think is important and you think you are in control of and you immerse yourself in the whims of nature….and thankfully, hopefully, you learn to surf. The accommodations…you don’t need a TV. You don’t need room service. You will sleep. You may be sore. You will sleep. You can walk to the beach for the sunsets or the bonfire. You will “own” the restaurant/bar. Seriously, they make you feel like you own the place. Food is excellent and plenty of it. Beer…at Happy Hour (5-9)…$1.25 …get serious. The staff likes doing what they do so much that when they are done for the day…they often come back for the fun. Jesse Bishop and the Banana Kings are NOT to be missed. Let go for the week…it may just be the best “working” vacation you will ever have. When it comes to surfing, let me tell you about their instructors. In a word…awesome. Rigo..focused on basics and dances on the waves, Flash…always in the moment. He made me just want to be better, he is Pure Vida…Carlos….plays..he plays on the waves…wait until you see him, he is joy and transfers that joy to you…Edgar..is the intellect, he will break it down, talk you through the seminars and is incredibly patient…and Killian…he teaches you to hunt waves and then he soars and makes you dream of getting better to fly like him…(it ain’t going to happen but you can dream) !!!! The beauty is that you will rotate amongst the group and learn something from each one… if you are paying attention. Finally, you will make new friends. People like yourself who want to be with people like yourself. This creates the best memories…fun people in a fun place, doing fun things! Age is immaterial, it is all about childlike fun. Surfing is fun…learning to surf is fun. So imagine this…in the morning you wake up after a great night’s sleep and walk down to Joe’s to grab breakfast before your lesson. Frederico greats you by name, your coffee in hand, without a cloud in the sky, your fellow camp-mates are gathering, six of you sharing a table under the thatch roof, laughing at yourselves and how your ribs hurt. 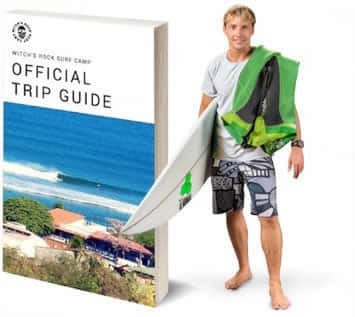 The instructors arriving with zinc covering their faces giving them the tribal look you always wanted, your board is waxed, waiting and ready to go….just a short walk to the beach…….you are alive, you are living…Witch’s Rock Surf Camp…..Pure Vida. Next Post…You know you’ve truly lost yourself in paradise when you completely lose track of the days!